Greetings and welcome to Fall ya’ll! September is here and Fall is in the air, however here in Nashville it is still very hot! School is in full swing and our little family is busy, busy….anybody with me!? So who really has time to cook a delicious, nutritious week night dinner that doesn’t take forever?! I think we all can agree that we have good eating intentions yet when the week hits with an agenda full of work, school, sport activities, and obligations, it is super difficult to keep healthy going unless meals are simple to throw together…. can I get an AMEN!. One of my first recommendations when is comes to keeping week night meals simple and healthy is pre-planning a bit! If there is fresh food on hand it is really helpful to throw together a quick meal the whole family can enjoy without opting for the fast-food drive through at the hungry dinner hour. One of my favorite ways to keep dinner super simple, budding with tasty nutrition for the whole family are one pan meals!!! One of our very favorite pan meals lately has been the one pan salmon meal combined with our favorite vegetables. All you need is a large salmon filet, colorful vegetables, seasoning, and a pan! Simple, simple yet full of nutrition, taste, and very quick! Pan meals can be created in so many different ways but we have been loving this fish option that offers healthy omega 3 fatty acids, healthy fat, protein, loads of vitamins and minerals from the vegetables. When it comes to adding the vegetables I also like to encourage using an array of color. The variety of color in the vegetables will offer a variety of nutrients that will nourish the whole family! I also like to recommend purchasing wild caught salmon filets if possible, the wild caught fish will generally have less mercury content verses some farm raised fish. So if you are in a dinner rut and need something fast, a healthy pan meal can offer a nutritious, delicious dinner in a very few minutes! This one pan salmon meal is just one idea and I hope if is inspiring to try lots of different pan meals or combinations. Enjoy! Recipe: Yields approx. 4 servings. I like to keep the seasoning simple so I typically drizzle olive oil over the fish and vegetables with balsamic vinegar or Braggs liquid amino acids, lemon juice, seat salt, and pepper. This is where individualized taste preference kicks in and I encourage using some creativity when creating the seasoning that sounds good to your taste buds. Preheat oven at 400 degrees. Line baking sheet with nonstick aluminum foil or spray/coat with olive oil. Place salmon filet in the center of the pan and add chopped or sliced vegetables around the salmon. 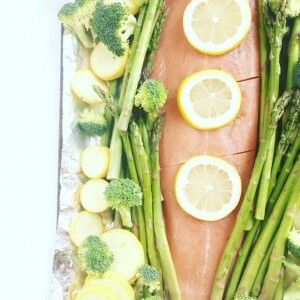 Place sliced lemon rounds on top of the salmon filet, season to taste preference and bake 12-15 minutes until salmon is fully cooked and vegetables are softened. Remove from heat and serve. Enjoy!